Whether you’re a first-timer or an experienced horseman, enjoy an unforgettable guided expedition through woodlands rich with wildlife on a horse chosen to match your skill level. Call us for details and reservations. Enjoy a western-style, one-hour guided ride on beautiful trails through the woodlands and meadows of the estate. Suitable for beginner to intermediate-level riders. Minimum age is 8 years. Offered daily at 10 a.m., 12 p.m., 2 p.m., and 4 p.m. Reservations are recommended. Enjoy a two-hour private trail ride. Offered daily at 9:30 a.m., 12:30 p.m., and 3:30 p.m. (times may vary). Two-day advance reservations are required. Available for 1-4 people ages 8 and up. 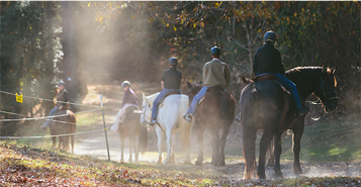 Enjoy a private three-hour trail ride* and picnic lunch. Some riding experience needed. Offered daily at 10:30 a.m. (time may vary). Two-day advance reservations are required. Available for 2-4 people ages 8 and up. *Two and a half hours of saddle time with a 30-minute stop for lunch. *Prices are in addition to estate admission and subject to change. Plus applicable tax. Riding weight limit is 200 lbs. for the Biltmore Equestrian Center and 250 lbs. for trail rides. 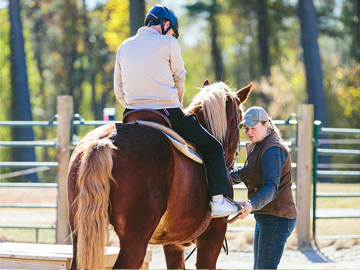 All riders are required to wear a helmet and boots, sneakers, or hard-soled shoes that come up to the ankle on guided trail rides. No time for an outdoor activity or a Behind-the-Scenes tour of Biltmore House the day of your visit? No problem! If you make a reservation for a next-day outdoor activity or this tour the day of your visit, you can return to enjoy your activity or tour without paying a $25 next-day upgrade. Reserve at any Guest Services station or at the Outdoor Adventure Center. Use our interactive map to locate Guest Services on the estate. *Does not apply to hiking or biking. Some restrictions may apply.